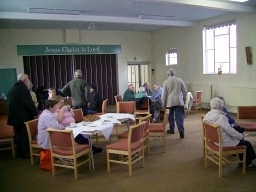 Thank you for visiting Cromwell Hall Christian Fellowship's website. We always extend a very warm welcome to visitors. Our full list of Services and other activities can be found here. 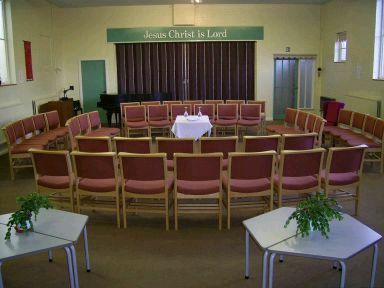 Who goes to Cromwell Hall Christian Fellowship? If you are thinking of coming to Cromwell Hall Christian Fellowship for the first time, while you are welcome at any of our services, may we suggest the Sunday Evening Service which is held at 17:30 on a Sunday evening. An explanation of our main services and meetings together with some information on our practices can be found here. We commence by singing a few hymns and choruses, often interspersed with an quiz for the children, before listening to a talk lasting about 15-20 minutes. Where is Cromwell Hall Christian Fellowship? 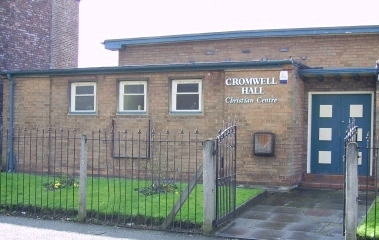 Cromwell Hall Christian Fellowship is situated very near the centre of Levenshulme, and easily accessible by car, train or bus. For directions on how to find us, please click here. The New King James Version is the version of the Bible which is offered as you arrive. It will most probably be the version which is read. Don't worry if you want to bring a different one or this isn't your usual version as members of the congregation, as well as our speakers, use a variety of versions - someone will help you find any obscure Bible passages. While we aim to be an all-inclusive church, our resources are limited. Please do not hesitate to contact us to discuss specific needs. Wheelchair users: Our premises are wheelchair accessible and are situated on one level. We only have standard, non-adapted toilet facilities. Visually impaired: We have large print copies of some of our hymn books. Hard of hearing: We do have an loop for hearing aid users. What is Cromwell Hall Christian Fellowship's history? Please click here to be transferred to our history page.